Terry fox challenged himself every day to raise the most money he could for Cancer. This year, once again, HOLY SPIRIT is continuing his Marathon of Hope. Dear parents, guardians, and students, on the morning of Thursday, September 27, 2018, Holy Spirit will be participating in the “School Terry Fox Walk”. From coast to coast, thousands of Canadian schools and millions of students will be taking part in this Terry Fox fundraising event. We are proud to be among those participating. We ask that each student donate to this great cause with a toonie, $5, $10, $20, $50, $100 or whatever donation you wish to give. If you’d like a tax receipt (for donations of $20 or more) please make the cheque payable to Terry Fox Foundation along with an attached note which has your full name and mailing address. 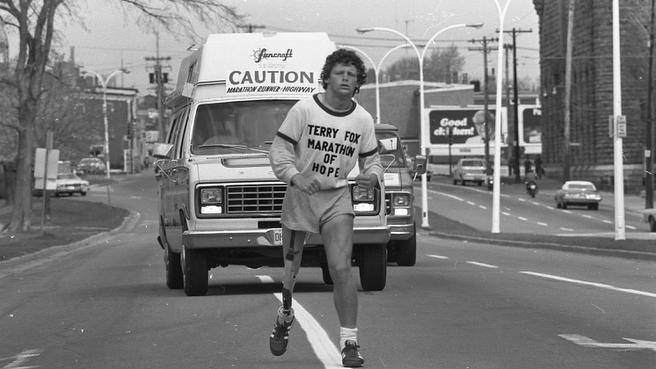 Tax receipts will be issued by the Terry Fox Foundation. All students who bring in their donations by Wednesday, September 26, 2018, will have their name entered in a draw for a Terry Fox t-shirt. This event will not only help to raise funds for cancer research, but it will also increase our students’ awareness of Terry Fox and his drive to never give up. Terry Fox is a true Canadian hero who demonstrated great COURAGE which is our virtue for September. All monies raised through our event will be forwarded to “The Terry Fox Foundation” to further the cause of cancer research. In the last 12 years, Holy Spirit has raised a total of $12,289.94. Last year alone we raised $1249.30 for cancer research. Our goal is to try to match or surpass last year’s contribution. We are confident we can realize this goal with the full participation of the school community. We are counting on your support! Let’s keep Terry’s dream of finding a cure for cancer alive! Unlike other major fundraising events, the Terry Fox Run has no corporate sponsorship. This is in accordance with Terry Fox’s original wishes of not seeking fame or fortune from his endeavour. The Terry Fox Foundation is an industry leader in donating 84-cents-per-dollar raised directly to cancer research as it is volunteer driven. Many people volunteer their time and energy into keeping the dream alive. On the day of our Terry Fox Walk, students are asked to wear red and white to show our pride in Canada and our support of Terry Fox and his dream. If your child has a Terry Fox t-shirt they could wear that instead. Please have your child dress appropriately (running shoes) and bring in their donation by Wednesday, September 26, 2018. We look forward to the experience and thank you for once again supporting this memorable event. Thank you to Mrs. Chiarot and Mrs. Stinson for their hard work in organizing this year’s event. Next Story Next post: Active School Travel. Move more, move better.